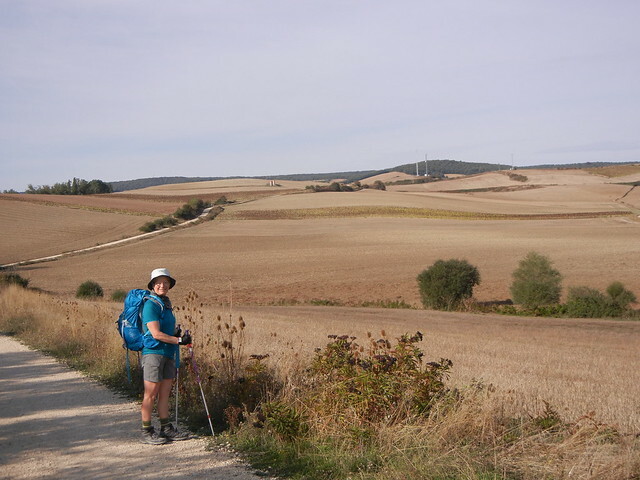 The Camino wound through the streets of Belorado which Dave explored briefly yesterday and I hadn’t seen at all. We really liked what we saw of the town. 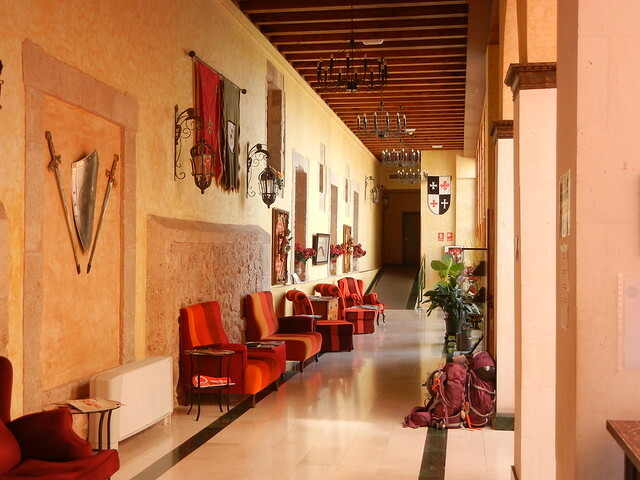 It has a spacious plaza with a medieval arcade lined with shops, bars and restaurants. Many of the walls have been painted by artists and there are interesting imprints of hands and feet on plaques set into the paving bricks. 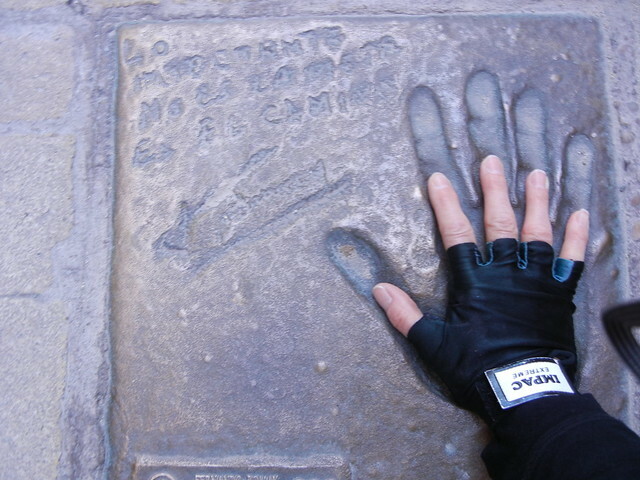 At least one of the 2,100 people who lives here is a giant, judging by the size of his hand! This morning was the coldest morning yet, and it seems that most of the litter on the Camino is due to those cold mornings. Noses run, and it is so easy when reaching into a pocket for a tissue to pull out more than one. There is the odd plastic bottle and candy wrapper, but mostly what you see are tissues. The trail today was quiet, on level earthen tracks, and through open countryside. The sound of the traffic wasn’t bothersome at all, unlike yesterday. 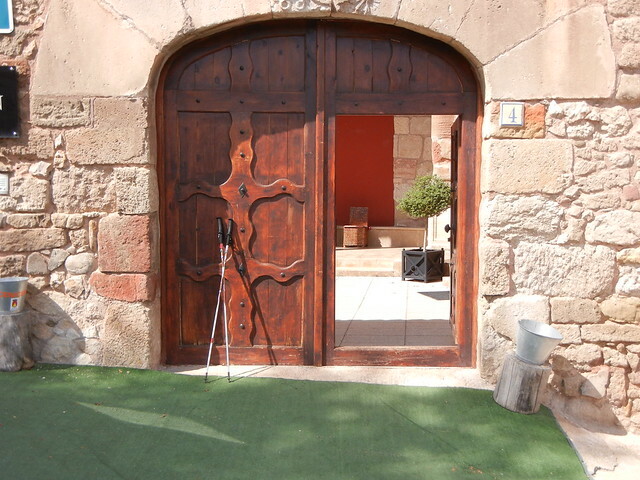 It was only when we were about to arrive at Villafranca de Montes de Oca that we were back to walking alongside the busy highway with trucks zooming past. The highway continues through the narrow street of the town and traffic doesn’t slow down. At least the albergue/hotel where we are stayng is set back from the highway behind the church and is quiet except for the church bells. Wow! 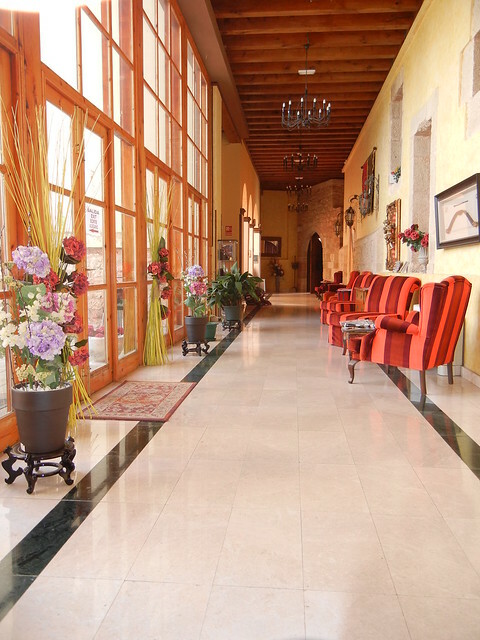 The San Anton Abad Hotel/Albergue where we are staying is impressive! 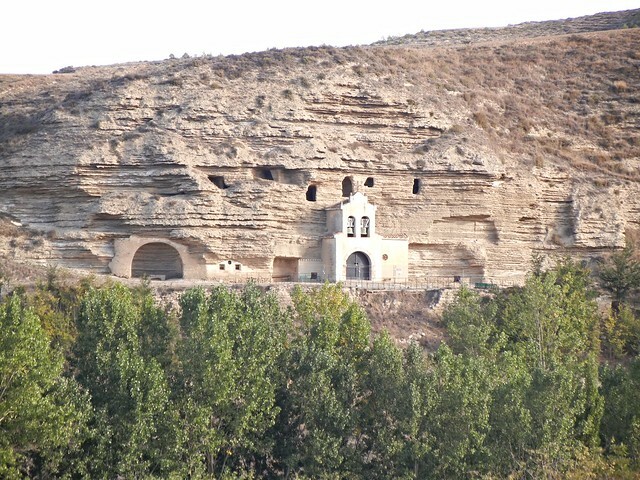 It was built in 1377 and was the most important hospital on the Camino de Santiago to serve pilgrims. The owner has travelled the Camino, and this hostel fulfils his wish to “give something back.” Here is what you can get for 8 Euros a night. We paid 30 Euros to have a private room, but the dormitories are very nice too. After settling into our room and having lunch, we did take that 4.6 km return trip out to a rocky gorge which leads to a stunning reservoir at the head of the Rio Oca. As soon as I saw the sign “PELIGROSO!” (DANGER!) and the rockfaces looming on either side of the gorge, I turned back. Not a good place to be during an earthquake! I wasn’t going there! Nada! No way! Resting in the shade of a tree in the church yard was more my style! Dave was fearless and I was contented just with seeing the pictures. Ahhh! 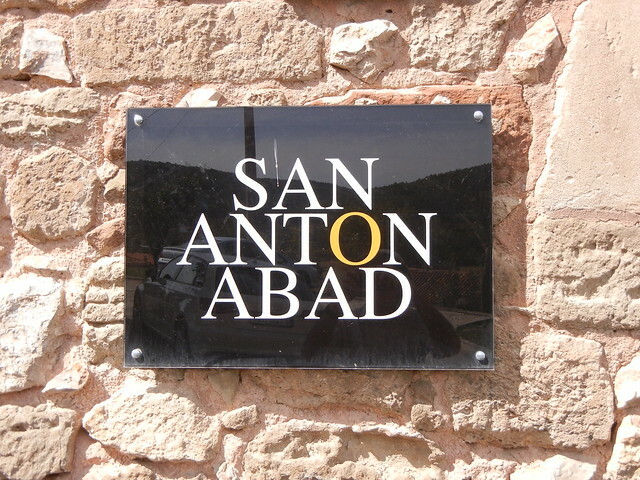 I remember San Anton Abad! I stayed there too, but in one of the larger dorms. What a beautiful place it was. I remember sitting in one of those orange chairs with my tablet while I journaled since WIFI was strongest there. Memories are flooding back! I was fascinated by a large lightening storm that night. The sky surged with electricity and a few of us pilgrims stood outside and watched. My laundry didn’t dry that night and as a result and I had to pin it to the back of my pack while I walked the next day.